Two-pipe systems allow steam to rise from the boiler to the radiators just as in the one pipe system. However, the condensate returns to the boiler through a second pipe. Two-pipe systems have temperature activate traps located at the end of the flow through the radiator, at the start of the return pipe. When the radiator is cold the trap is open. As steam enters the radiator it pushes the cold air in the radiator out through an air vent. When steam reaches the trap, the high temperature causes the trap to close thus keeping the steam in the radiator. When the room reaches the thermostat setting, the boiler shuts off and steam flow stops. As the radiator cools, the water vapor condenses and starts to fill the radiator with water. 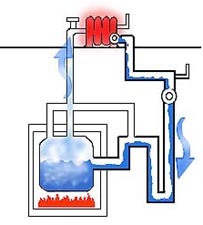 When it cools sufficiently, the trap opens and allows the condensate to flow back down through the return pipe. Steam traps should be checked frequently. If they stick open, steam will flow through the radiator and down the return pipe reducing the efficiency of the heat transfer and perhaps unbalancing the entire distribution system.